As the adventurers work to track down the missing colonists, the trail leads to a nearby island. There, they discover the submerged ruins of a cathedral dedicated to a now-dead god; the site has become a lair of an ichthyic monster and its cunning minions. The adventurers must fight their way through flooded chambers and vicious monsters to rescue the kidnapped colonists and learn of a greater threat to the region—and to humanity as a whole. 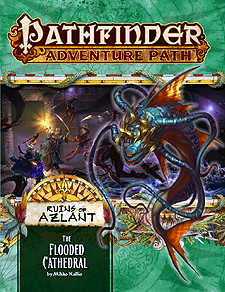 "The Flooded Cathedral," a Pathfinder adventure for 7th-level characters, by Mikko Kallio. A double-sized article exploring the divine beings worshipped in ancient Azlant, by Adam Daigle. An under-the-hood look at the ancient world's marvelous clockwork creations, by Mikko Kallio. A bestiary of terrifying monsters and fantastic creations, by John Compton, Kalervo Oikarinen, and David Schwartz.